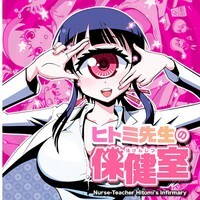 Plot Summary: Hitomi is a somewhat clumsy but kind school nurse who happens to have only one big eye. She is always at the infirmary along with her assistant (whose gender is left ambiguous throughout the manga). The story follows Hitomi's daily life with the unusual middle school students (such as a long-tongue girl and a zombie girl) who visit her.